To permit faster loading, our Fictional Cereals guide is divided into multiple pages. You will find a link to the second page at the bottom of this page. Thank you, and enjoy! Born in August 1992, Powdered Toast Man is a fictional cereal character from the Ren and Stimpy Show. Powdered Toast Man (voiced by Frank Zappa, and later: Gary Owens), the world's most misguided superhero, manages to make matters worse after he comes on the scene. As a breakfast cereal, Powdered Toast Man shakes toast particles off his shoulder and winks more of the particles out of his eye, then leaves with a gas-powered leap. The gas power is provided by Vitamin "F". His nemisis is Waffle Woman. Preemo also "makes" Sugar Frosted Milk, and Sugar Toasted Sod Pops (a prime source of clorophyll). "The Tick" is a human-sized blue tick crime fighter. Calvin of Calvin and Hobbes fame has been known to eat Chocolate Frosted Sugar Bombs which Calvin says are "tasty, lip-smacking, crunchy-on-the-outside, chewy-on-the-inside, and they don't have a single natural ingredient or essential vitamin to get in the way of that rich, fudgy taste." Hobbes says the cereal makes his heart skip and likens this cereal to "eating a bowl of milk duds". Ren and Stimpy promoted Logs, an all-natural splinter-free high-fiber log cereal. Other cereals seen on Ren and Stimpy include: Cardboard Cereal, Sugar Frosted Lumps, and Sugar Cows. Lil Penny is a small puppet. 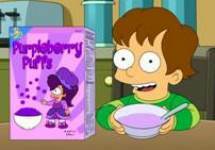 His cereal, Li'l Penny's "The Breakfast of Friends of Champions" is made with 100% sugar, and is high in fat. Krusty is the clown from the Simpsons. He has his own children's show and endorses a lot of bad products including three cereals: Krusty Brand Cereal with FREE Flesh Eating Bacteria inside every box; Krusty Brand Cereal ("Krusty-Os") which come with a FREE jagged metal Krusty-O in every box; and Chocolate Frosted Frosty Krusty Flakes "only sugar has more sugar". Other cereals appearing on The Simpsons include "Frosting Gobs", "Jackie O's", "Aerosmith Sweet Emotions" and "Good Old Oats" (which Lisa used to stick on Bart and Homer to make them think they had leprosy). Moe asks if there is a cereal for people who have syphilis, and later is seen eating from a boxed labeled "Penicill-O's." The cereal mascot "Count Fudgula" was also featured in an episode. Frosted Krusty-O's were actually boxed in 2007 and sold at select 7-11 and Kwik-E-Mart stores during the summer of 2007 to promote The Simpson's Movie. TurboMan Cereal was a prop in the 1996 movie "Jingle All The Way" starring Arnold Schwartzeneger. "Hey Everyone!" TurboMan Cereal provides 7 vitamins and minerals, and it comes "with pink marshmallow boosters". The box was also spotted in a January 2004 Gateway ad. One guy says to his grocery-toting buddy in a parking lot, "Are you ready for the game? I am". Cut to his new Gateway Plasma TV in the car. The buddy is shown carrying two bags of groceries. A box of TurboMan Cereal is prominently displayed in the top of one bag. Woody, from Disney's "Toy Story 2", was once featured on boxes of Cowboy Crunchies "...they're good!" The manufacturer of the cereal sponsored the old black and white "Woody's Roundup" TV shows. Here's a movie prop from Mystery Science Theater 3000. Joel enjoys a delicious bowl of Capt'n Ron cereal in Episode 502, Hercules. Pictured on the box is Kurt Russell as Captain Ron from his 1980's movie Cap'n Ron. Jimmy the Hapless Boy (1994) also known as Jimmy the Idiot Boy! This is his cereal. He's the one on the left. The cereal comes free inside every box of Jimmy of the Future Paint-by-Number kit. And inside each box of cereal is a prize --- a pencil-enhancer! Jack Skellington, the Pumkin King, from Tim Burton's 1993 feature Nightmare Before Christmas appeared on boxes of Nightmare Puffs (along with his dog and the two kids from the movie). Supposedly, this was one of about twenty five or so that was used for a promotional shoot for the film. Fry: "I'm never gonna get used to the thirty-first century. Caffeinated bacon? Baconated grapefruit? Admiral Crunch?" Leela: "Well if you don't like that, try some Archduke Chocula." 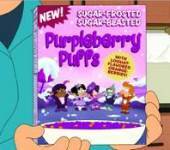 Sugar Frosted, Sugar Blasted, Purpleberry Puffs with Loquat Flavored Orange Berries, from the Futurama (TV) episode "Saturday Morning Fun Pit". Images courtesy of Sean Cleary. Rudy from the comic strip "For Better Or For Worse" is seen enjoying Soggies "Your Sugar High" cereal. Liz: "It's amazing what you can find in the second-hand stores! I even got 4 placements for 3 bucks!" Eric: "Placemats? Why do we need placemats?" Liz: "They're for Rudy to put his elbows on while he's eating cereal out of the box." Another strip featured a grocery aisle full of these cereals: Bran Ola, Sugar Soggs, Multi Crunch, Raisin Poffs, Muslix, Moose Lix (featuring a moose head on the box), Hot Oat, Instant Gruel, Bran Bomb, Whaet Buds, Puffed Grano-Toasties, Munch-A-Roonie (featuring a red-haired clown with spoon), Hole Grain (with a golfer on a putting green), and Wheaty Crunch "Almost Nutricious". Cereal Not Included (early 1990's) is the size of a ordinary cereal box but it is full of toys! You get a box full of toy soldiers and not an ounce of cereal. The comic srip "Jump Start" featured a box of "Super Sugar Slaps" featuring the character "Slappy the Bear" on the box. Sunny: "Dexter, I've noticed that you don't read books." Dexter: "I prefer cereal boxes." Major Flake is a mascot with Soggy Cereals. Major Flake is also the title of the 2001 Cartoon Network cartoon in which he appears. He is sort of a landlubber reincarnation of "Cap'n Crunch". His sidekick is named sparkles. They live with other cereal mascots including Sugar Buzz (a hyperactive bee on a perpetual sugar high), Choc Bots (little chocolate robot aliens who want to take over the world), and King Sweet (the leader of the mascots). Disclaimer: This is a non-commercial site with the sole purpose of assisting visitors in locating information on their favorite breakfast cereal characters. All of the names, characters, brands, and icons listed here are trademarks of their respective parent companies and cannot be used for commercial purposes. Continue to watch your favorite shows and support your favorite characters!